Freegans are people who employ alternative strategies for living based on limited participation in the conventional economy and minimal consumption of resources. Freegans embrace community, generosity, social concern, freedom, cooperation, and sharing in opposition to a society based on materialism, moral apathy, competition, conformity, and greed. After years of trying to boycott products from unethical corporations responsible for human rights violations, environmental destruction, and animal abuse, many of us found that no matter what we bought we ended up supporting something deplorable. We came to realize that the problem isn’t just a few bad corporations but the entire system itself. Freeganism is a total boycott of an economic system where the profit motive has eclipsed ethical considerations and where massively complex systems of productions ensure that all the products we buy will have detrimental impacts most of which we may never even consider. Thus, instead of avoiding the purchase of products from one bad company only to support another, we avoid buying anything to the greatest degree we are able. The word freegan is compounded from “free” and “vegan”. Vegans are people who avoid products from animal sources or products tested on animals in an effort to avoid harming animals. Freegans take this a step further by recognizing that in a complex, industrial, mass-production economy driven by profit, abuses of humans, animals, and the earth abound at all levels of production (from acquisition to raw materials to production to transportation) and in just about every product we buy. Sweatshop labor, rainforest destruction, global warming, displacement of indigenous communities, air and water pollution, eradication of wildlife on farmland as “pests”, the violent overthrow of popularly elected governments to maintain puppet dictators compliant to big business interests, open-pit strip mining, oil drilling in environmentally sensitive areas, union busting, child slavery, and payoffs to repressive regimes are just some of the many impacts of the seemingly innocuous consumer products we consume every day. We live in an economic system where sellers only value land and commodities relative to their capacity to generate profit. Consumers are constantly being bombarded with advertising telling them to discard and replace the goods they already have because this increases sales. This practice of affluent societies produces an amount of waste so enormous that many people can be fed and supported simply on its trash. As freegans we forage instead of buying to avoid being wasteful consumers ourselves, to politically challenge the injustice of allowing vital resources to be wasted while multitudes lack basic necessities like food, clothing, and shelter, and to reduce the waste going to landfills and incinerators which are disproportionately situated within poor, non-white neighborhoods, where they cause elevated levels of cancer and asthma. Perhaps the most notorious freegan strategy is what is commonly called “urban foraging” or “dumpster diving”. This technique involves rummaging through the garbage of retailers, residences, offices, and other facilities for useful goods. Despite our society’s sterotypes about garbage, the goods recovered by freegans are safe, useable, clean, and in perfect or near-perfect condition, a symptom of a throwaway culture that encourages us to constantly replace our older goods with newer ones, and where retailers plan high-volume product disposal as part of their economic model. Some urban foragers go at it alone, others dive in groups, but we always share the discoveries openly with one another and with anyone along the way who wants them. Groups like Food Not Bombs recover foods that would otherwise go to waste and use them to prepare meals to share in public places with anyone who wishes to partake. 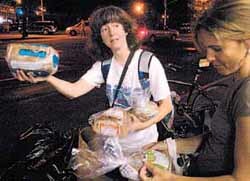 By recovering the discards of retailers, offices, schools, homes, hotels, or anywhere by rummaging through their trash bins, dumpsters, and trash bags, freegans are able to obtain food, beverages, books, toiletries magazines, comic books, newspapers, videos, kitchenware, appliances, music (CDs, cassettes, records, etc. ), carpets, musical instruments, clothing, rollerblades, scooters, furniture, vitamins, electronics, animal care products, games, toys, bicycles, artwork, and just about any other type of consumer good. Rather than contributing to further waste, freegans curtail garbage and pollution, reducing the over-all volume in the waste stream. Lots of used items can also be found for free or shared with others on websites like Freecycle and in the free section of your local Craigslist. To dispose of useful materials check out the EPA’s Materials and Waste Exchanges directory. In communities around the country, people are holding events like “Really, Really, Free Markets” and “Freemeets”. These events are akin to flea markets with free items. People bring items to share with others. They give and take but not a dollar is exchanged. When freegans do need to buy, we buy second-hand goods which reduces production and supports reusing and reducing what would have been wasted without providing any additional funds for new production. Because of our frequent sojourns into the discards our throwaway society, freegans are very aware of and disgusted by the enormous amounts of waste the average US consumer generates and thus choose not to be a part of the problem. So, freegans scrupulously recycle, compost organic matter into topsoil, and repair rather than replace items whenever possible. Anything unusable by us, we redistribute to our friends, at freemarkets, or using internet services like freecycle and craigslist. Freegans recognize the disastrous social and ecological impacts of the automobile. We all know that automobiles cause pollution created from the burning of petroleum but we usually don’t think of the other destruction factors like forests being eliminated from road building in wilderness areas and collision deaths of humans and wildlife. As well, the massive oil use today creates the economic impetus for slaughter in Iraq and all over the world. Therefore, freegans choose not to use cars for the most part. Rather, we use other methods of transportation including trainhopping, hitchhiking, walking, skating, and biking. Hitchhiking fills up room in a car that would have been unused otherwise and therefore it does not add to the overall consumption of cars and gasoline. Some freegans find at least some use of cars unavoidable so we try to eliminate our dependence on fossil fuels by using cars with diesel engines converted to run on biodiesel or “veggie-oil” literally fueling our cars with used fryer oil from restaurants – another example of diverting waste for practical use. Volunteer groups are forming everywhere to assist people in converting diesel engines to run on vegetable oil. Freegans believe that housing is a RIGHT, not a privilege. Just as freegans consider it an atrocity for people to starve while food is thrown away, we are also outraged that people literally freeze to death on the streets while landlords, banks and cities keep buildings boarded up and vacant. Squatters are people who occupy and rehabilitate abandoned, decrepit buildings. Squatters believe that real human needs are more important than abstract notions of private property, and that those who hold deed to buildings but won’t allow people to live in them, even in places where housing is vitally needed, don’t deserve to own those buildings. In addition to living areas, squatters often convert abandoned buildings into community centers with programs including art activities for children, environmental education, meetings of community organizations, and more. We live in a society where the foods that we eat are often grown a world away, overprocessed, and then transported long distances to be stored for too long, all at a high ecological cost. Because of this process, we’ve lost appreciation for the changes in season and the cycles of life but some of us are reconnecting to the Earth through gardening and wild foraging. Many urban ecologists have been turning garbage-filled abandoned lots into verdant community garden plots. In neighborhoods where stores are more likely to carry junk food than fresh greens, community gardens provide a health food source. Where the air is choked with asthma inducing pollutants, the trees in community gardens produce oxygen. In landscapes dominated by brick, concrete, and asphalt, community gardens provide an oasis of plants, open spaces, and places for communities to come together, work together, share food, grow together, and break down the barriers that keep people apart in a society where we have all become too isolated from one another. Wild foragers demonstrate that we can feed ourselves without supermarkets and treat our illnesses without pharmacies by familiarizing ourselves with the edible and medicinal plants growing all around us. Even city parks can yield useful foods and medicines, giving us a renewed appreciation of the reality that our sustenance comes ultimately not from corporate food producers, but from the Earth itself. Others take the foraging lifestyle even farther, removing themselves from urban and suburban concepts and attempting to “go feral” by building communities in the wilderness based on primitive survival skills. How much of our lives do we sacrifice to pay bills and buy more stuff? For most of us, work means sacrificing our freedom to take orders from someone else, stress, boredom, monotony, and in many cases risks to our physical and psychological well-being. Once we realize that it’s not a few bad products or a few egregious companies responsible for the social and ecological abuses in our world but rather the entire system we are working in, we begin to realize that, as workers, we are cogs in a machine of violence, death, exploitation, and destruction. Is the retail clerk who rings up a cut of veal any less responsible for the cruelty of factory farming than the farm worker? What about the ad designer who finds ways to make the product palatable? How about the accountant who does the grocery books and allows it to stay in business? Or the worker in the factory that manufacturers refrigerator cases? And, of course, the high level managers of the corporations bear the greatest responsibility of all for they make the decisions which causes the destruction and waste. You don’t have to own stock in a corporation or own a factory or chemical plant to be held to blame. By accounting for the basic necessities of food, clothing, housing, furniture, and transportation without spending a dime, freegans are able to greatly reduce or altogether eliminate the need to constantly be employed. We can instead devote our time to caring for our families, volunteering in our communities, and joining activist groups to fight the practices of the corporations who would otherwise be bossing us around at work. For some, total unemployment isn’t an option it’s far harder to find free dental surgery than a free bookcase on the curb but by limiting our financial needs, even those of us who need to work can place conscious limits on how much we work, take control of our lives, and escape the constant pressure to make ends meet. But even if we must work, we need not cede total control to the bosses. The freegan spirit of cooperative empowerment can be extended into the workplace as part of worker-led unions like the Industrial Workers of the World.